What’s disappointing is the chorus of people who prize the avoidance of confrontation over the principle of equality and equal human rights. Let us not escalate the situation, they say. Let us not have confrontations in Singapore, that will disturb our carefully constructed and manicured law and order and harmony. Interestingly, this argument is often framed in a way that portrays LGBT people and activists as the ones who are “escalating” the situation and “pushing their beliefs into people’s faces”. Some even go as far as to say that LGBT people in Singapore shouldn’t be so confrontational and vocal because it is “not that bad” in Singapore, even with S377A on the books. The onus is, for some reason, placed on the shoulders of LGBT activists to not be confrontational, while conservatives spew hate in the mainstream media in the name of religious freedom. The logic appears to be that LGBT people in Singapore should sit down and shut up because we are not Uganda. 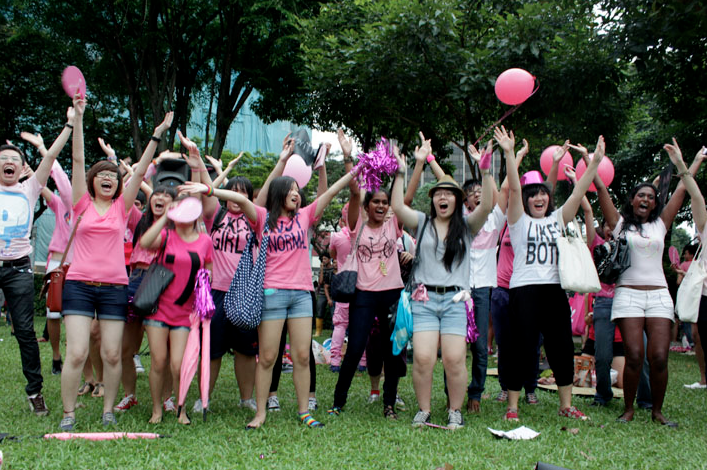 I have seen comments accusing Pink Dot organisers of “escalating” the matter by engaging security personnel. In these comments there is little to no acknowledgement of the fact that there has been a surge of anti-gay rhetoric, and a strident campaign organised and supported by those who have referred to gay people as “cancers” and even opposed gay people’s access to health advice in the form of an HPB FAQ. There is little acknowledgement of the fact that such hatred can manifest ways that affect the safety of LGBT people in their everyday lives. There is little acknowledgement of the fact that the dehumanising rhetoric is not coming from Pink Dot, nor of the fact that Pink Dot organisers are not the ones who are advocating against the rights of religious conservatives. Lawrence Khong and Ustaz Noor Deros can continue to be as religious and as conservative as they like regardless of whether Pink Dot goes ahead or not. Heck, they can even go on with their lives exactly as they want even if S377A is repealed. On the other hand, the campaigning against Pink Dot and LGBT activism has very real, everyday effects on LGBT people’s lives, depriving them of the rights that straight people enjoy and take for granted. In the light of such determination to prevent sexual minorities from accessing their rights, a stubborn clinging on to “harmony” and avoidance of confrontation smacks of selfishness and privilege. Some people can afford to say that we shouldn’t have public protests or demonstrations in Singapore, mostly because they already enjoy the rights that these public assemblies are pushing for. What they fail to understand is that others cannot afford to remain silent. Oppressed minorities cannot afford to sit down and wait for a benevolent majority to grant them what should rightfully be theirs; things rarely work that way. I hope that all my friends now sweating it out in Hong Lim Park are having fun. I hope that everyone – regardless of whether they are wearing pink, white, or all the colours of the rainbow – stays safe. I hope that people engage in debate and arguments based on principles of equality and human rights, rather than in physical violence. I have faith that they will, because I know that public demonstrations and assemblies aren’t synonymous with violence and chaos. Above all, I hope that they never give up in pushing for their rights, their freedom to love, and their freedom to be who they are.